And so began last night’s first-ever live performance of “30 Rock,” with Jack Donaghy (Alec Baldwin) addressing head-on the show’s live look. If the appearance of the episode evoked memories of “Saturday Night Live,” it was no accident, as the show wasn’t just live, but was performed in Studio 8H in the real-life 30 Rock, “SNL”’s home turf. 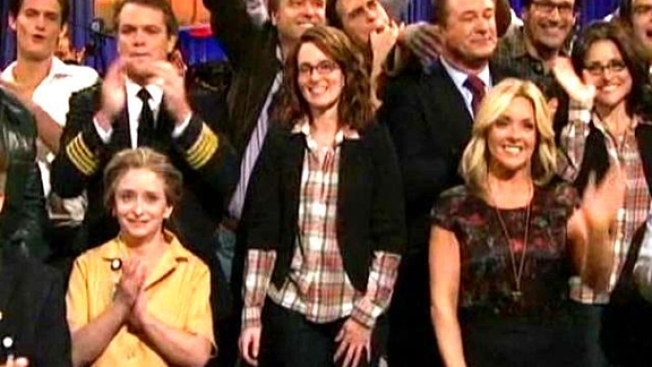 On a show loaded with veterans of live performance, like “SNL” alums Tina Fey (Liz Lemon) and Tracy Morgan, frequent “SNL” host Baldwin, and Broadway regular Jane Krakowski, going live for one night was a safe bet that paid off nicely. Even with the odds of a real disaster so low, the fact is that going live gave the whole thing a NASCAR-esque “Will they crash into a ball of fire” buzz that made most every punch line hit a little harder. And the writers of “30 Rock” wisely played into the morbid desire for failure, with jokes throughout the episode that were crafted around the expectation/hope/fear of botched or forgotten lines, performers losing their composure, the looming danger of a wardrobe malfunction and they even found time to take yet another shot at product placement. Adding to the festivities were some old friends. Jon Hamm reprised his role as Dr. Drew Baird, starring in a faux PSA that was very nearly offensive (and may have actually crossed the line, you’d have to ask a black person or an amputee). Matt Damon was back as Liz’s boyfriend Carol – with Bill Heder as his co-pilot. Chris Parnell’s Dr. Leo Spaceman was hawking his new album, "an ultra-strength, audio rebone-ulator." And Rachel Dratch remains a tremendous sport about getting totally screwed over by the show at its very beginning. But the best guest star of the evening had to be Julia Louise-Dreyfus, brought on to portray Liz Lemon in flashbacks. “When are you better looking in your memory?” Donaghy asked Liz as the camera cut away from JLD’s first appearance. Was it “30 Rock” at its very best? No. But it was still a helluva lot better than 90% of the sitcoms that have polluted the airwaves over the years. Sometimes artists need to make things to make a little more interesting for themselves – if Fey and her cohorts need to go live once every five years, by all means, bring it.